Rubbing alcohol is the common name for the molecule isopropyl alcohol. This chemical is very closely related to the familiar substance ethanol, or drinking alcohol, which is found in beer, wine and hard liquor. Unlike drinking alcohol, rubbing alcohol is not suitable for human consumption. It does, however, possess many of ethanol's chemical properties. For instance, like ethanol, it's soluble in water and it has a low boiling point. Rubbing alcohol's chemical properties give it utility in many household applications. One of the common household uses of rubbing alcohol is as a cleaning agent. Many toilet bowl and window cleaners, for instance, contain isopropyl alcohol. Unlike water, rubbing alcohol can dissolve sticky, gummy residues, making it ideal for removing sap or chewing gum from hands and surfaces. ReadersDigest.com says that rubbing alcohol removes hairspray residue from mirrors and windows. DVDs and CDs that have acquired fingerprints benefit from being rubbed down with some isopropyl alcohol on a soft cloth—the alcohol removes the fingerprints without damaging the delicate plastic of the disc. Habitual swimmers know that one of the most irritating and potential painful side effects of a love of water is its tendency to get stuck deep in the ear canal. At best, this leads to an annoying several hours of trying to remove the residual water, during which time it can be difficult to hear. At worst, moisture deep in the ear creates an ideal environment for infectious pathogens, leading to swimmers' ear, which can be quite painful. 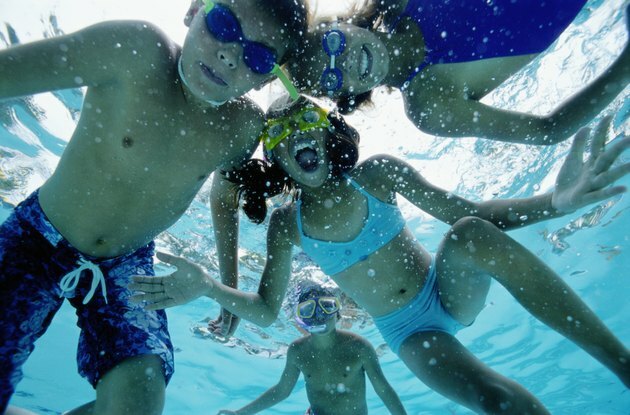 Rubbing alcohol can actually help swimmers prevent infection. According to the Material Safety Data Sheets for isopropyl alcohol, the chemical has a vapor pressure of 44 mmHg at room temperature, compared to water's vapor pressure of 23.8 mmHg. This means that it's much easier for isopropyl alcohol to evaporate than it is for water. As a result, while a puddle of water—whether on the counter top or in the ear—sticks around for a while, a puddle of rubbing alcohol quickly evaporates. When rubbing alcohol mixes with water, the resulting mixture has a vapor pressure between those of the original compounds. This means that pouring a bit of rubbing alcohol in the ear to mix with the water that's left there after swimming produces a mixture that evaporates much faster than water would on its own, drying the ear and preventing infection. Scorecard.org, an Internet site that provides information about chemicals and pollutants, notes that isopropyl alcohol is a disinfecting and sterilizing agent, because it kills bacteria, fungus and viruses. Nurses use it to clean skin of pathogens prior to giving an injection. Hospitals spray it on surfaces to kill infectious organisms and prevent the spread of disease. It can even be used at home to clean counter tops and other commonly touched, non-porous surfaces instead of other, more expensive, antibacterial agents.